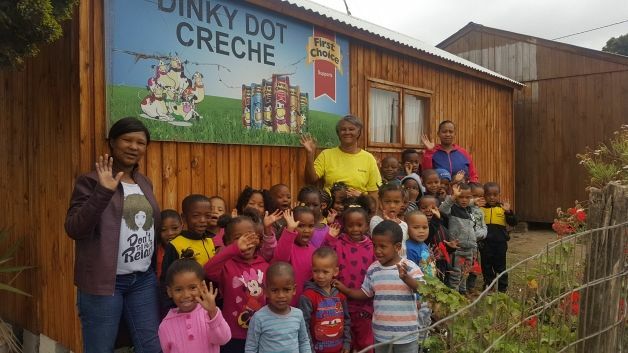 We are excited that Dienkie Dot, an ECD Centre that ITEC works with in the Humandorp area, featured in the local news recently! We are very proud of Felicity Toll, the principal, for her hard work in establishing and growing Dienkie Dot. Felicity, staff and children of Dienkie Dot. Photograph from RNews. Felicity was one of our Level 5 ECD Students, and two of her staff completed their Level 4 with us, and are now studying at Level 5. We also trained their Grade R Practitioner on the STELLAR emergent literacy programme. ITEC has trained 18 Level 4 students in the Humansdorp area, many of whom have proceeded to Level 5. We have now trained 38 Level 5 students there. You can read the news story about Felicity and Dienkie Dot here.